Google's toolbelt, the sidebar displayed on the search results pages when you click on "show options", has been updated with new features. There's a new option that lets you restrict results to blogs and an option to see web pages indexed by Google in the past hour (the date range can be customized by changing Google's URLs). If you don't want to see shopping sites in the list of search results, click on "fewer shopping sites" and Google will remove the results from sites like Amazon, BestBuy, eBay. 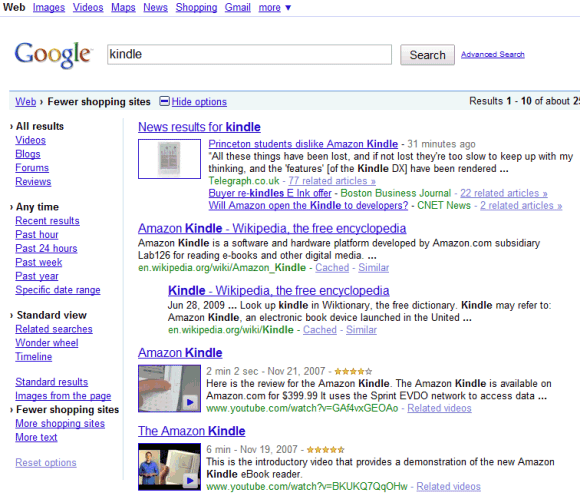 Google also offers the option to see "more shopping sites" in an interface optimized for price comparison. If you're logged in to your Google Account and the web history service is enabled, you can restrict the results to the web pages you've already visited. By default, Google Web History only tracks the search results you visit, but you can extend it to your entire browsing history. Google's toolbelt starts to become crowded and it's not easily discoverable, but it's a better place for refining results than the advanced search page because you can combine filters and see the results instantly. 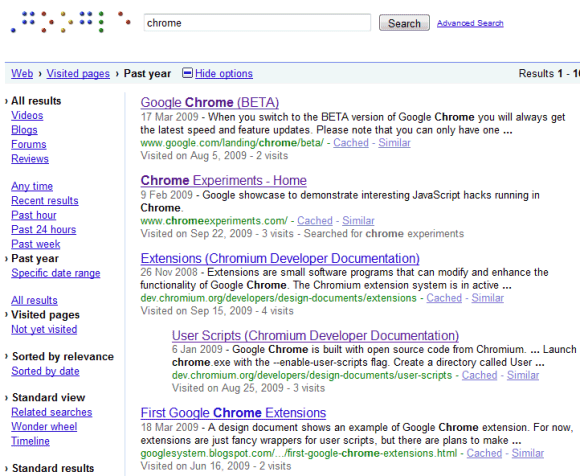 I noticed that there are contextually relevant Google search options available based on your search query as well. In the example I pointed out in the link, there are additional filters showing up that appear to be related to the search phrase such as restaurants, parking, for sale, apartments, hotel and more. I am already using google chrome and I fidn it to be very fast and its look very clean.. I find gmail also opens faster on this as compared to firefox.